While the election results poured in on Tuesday night, I sat motionless on the couch for hours. It was a different kind of dread than the usual daily fears. This sense of grave concern for the future left me powerless to act. Now that a few days have passed, the worries remain but have given way to a need for action. It’s going to be rough at times, yet I know there’s so much that each of us can do to make a difference every day. I mention the election because it raises internal questions about pursuits like this blog. Why continue to write about art when so much is going wrong? I’m under no illusions that many read my writing. It’s largely a personal diary. Should I close up shop and focus solely on social causes? It’s a legitimate question but also feels shallow and selfish given the larger issues. I’ve succumbed at times to believing that a Facebook or Twitter post makes a difference, and that’s obviously false. We need to do more and not get trapped in online echo chambers. Curling up in a ball and hoping things get better is cowardly. One way to influence change is through acquiring knowledge, and that’s my hope for this site. I try to engage with a variety of art but often fall into predictable patterns. I can write about Michael Mann and James Bond forever, but that’s too easy. This site is a small blip on the radar, but the media that I consume matters. I’m a 40-year-old white male living in a well-off, mostly white St. Louis neighborhood. My dad was an engineer, and my mom was a school teacher. My perspective is way too limited and needs to change. Exploring more diverse narratives on this blog is just one of many choices that I plan to make going forward. I’ll donate money and time to causes that I care about like protecting the environment, fighting racism and sexism, and supporting diverse liberal voices in politics. I’ll also try to do better here and spotlight a wide range of films and television. This includes work from other countries and filmmakers and actors that aren’t just white guys. It’s a small step and should build the right mindset to help support a brighter future. My introduction connects directly to Paul Robeson: Tribute to an Artist because I knew basically nothing about him. His name is familiar, yet he’s rarely cited as an early African-American star and activist. Narrated by Sidney Poitier, this 30-minute documentary presents Robeson’s incredible vocal talent and screen presence. It includes several performances of his signature tune “Ol’ Man River” and archival footage. It’s a nice primer on a complex man and film star of a different era. This Oscar-winning 1979 documentary was directed by Saul J. Turrell, a filmmaker and classic-film distributor that once led Janus Films. It’s the type of portrait that barely scratches the surface. I’m intrigued to learn more about Robeson’s life, especially about his activism. Turrell does a great job spotlighting Robeson’s achievements on stage and screen but only briefly delves into his political views. Why did the U.S. revoke his passport? We see Robeson performing communist songs, which was certainly enough in the late 1940s and early ‘50s. Robeson’s connections to the Soviet Union played a role in the obstructions, along with his race. Turrell highlights the lyrical changes in “Ol’ Man River” that corresponded to Robeson’s political evolution. The Showboat song seems quaint at first but grows in power with each performance. Robeson’s change to “You show a little grit/And you land in jail” is quite relevant today. The original sadness of this song becomes empowering with these updates. His deep baritone injects heart and fury into the later versions. We see the entire song with the edits near the end and witness its growing power. I'm amazed that so much of Robeson's past has been erased from our collective memory. This change was by design; he was even removed from records of his All-American football success. The downside in concentrating on the songs is limited time for more context. The film’s title supports that macro approach, however. This is a tribute to Robeson’s legacy, not a biography. Last year, Steve McQueen (12 Years a Slave) announced that he would direct a Robeson biopic. I’m unsure on the progress of this project but can’t think of a better choice. Robeson’s success and controversy are mostly forgotten, and a feature film would reveal his legacy to larger audiences. After seeing this documentary, I’ll definitely seek out more information about Robeson’s life in the near future. 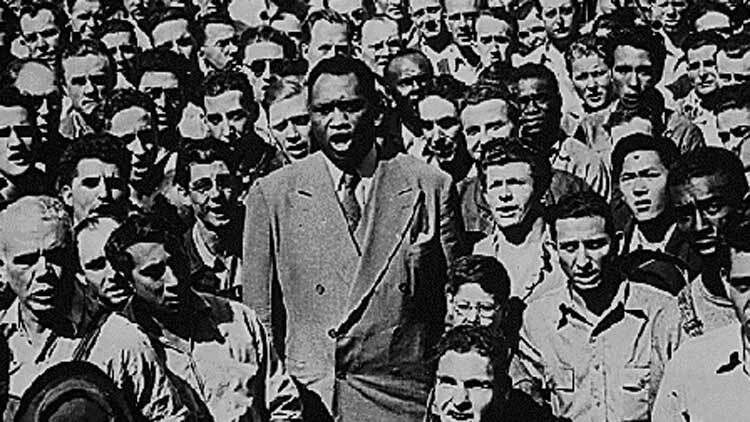 The Criterion Box Set Paul Robeson: Portraits of the Artist includes this documentary and seven Robeson films, plus many extra features. The new streaming service Filmstruck currently offers this movie plus four other Robeson films and supplements.